Eve is this really small startup that was founded to be like a disruptive device maker with an emphasis on community feedback to help them design the best products for their community. And not a bad idea. The Eve V 2 in 1 device that they are showing off at Computex 2017, has the ability to filter through the guidance offered by their users. The end result is a pretty great device which not just looks good, but also performs quite well. The response received by the company was really positive, with 500 units being sold in the first 3 hours of its campaign. Eve tech also attracted attention from the Finnish government, Intel and Microsoft. 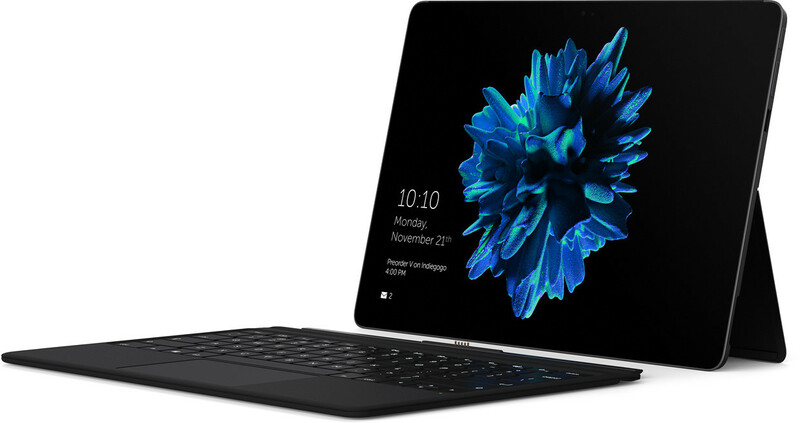 With its main competitor being the Microsoft Surface Pro 4, there is a lot in stake for the Eve V.
The Eve V pretty much seems like a Surface Pro 4 with two USB Type-C ports. But can it hold its own from the Surface Pro 4 or is it even better? That's what I am going to show! 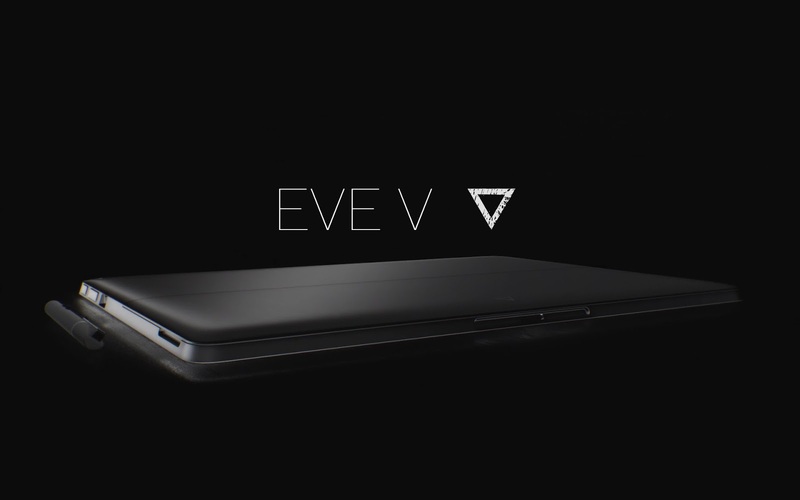 Considering the first hardware project by Eve, the Eve V is a very good piece of engineering. The models at Computex, although prototypes, had little to complain about. The aluminum uni-body felt sturdy and had a nice cool touch and were comparable to the Surface Pro 4. The fit and finish were spot on with no kind of creaks to be heard from anywhere of the V’s body. 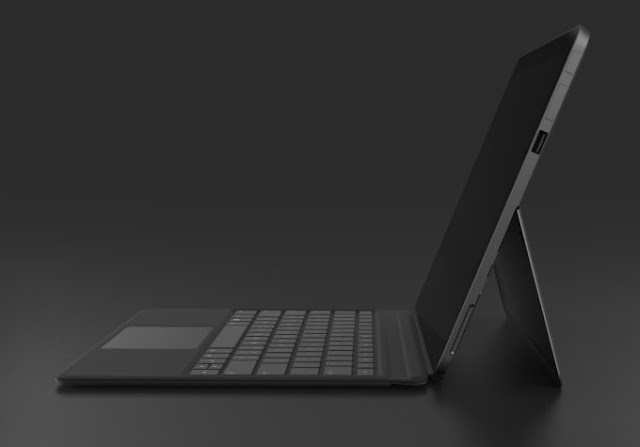 It is a bit thicker than the Surface Pro, but CEO Konstantinos Karatsevidis told that the slightly thicker body was chosen by the community of crowdfunders themselves, as it turns out that they would rather have a thicker body with better battery life than a slimmer device with lower battery capacity. The sleek black sandblasted aluminum body was sculpted by the industrial design team at Propeller near Eve Tech’s Finnish HQ, and features pillowed back and rounded corners with an integrated kickstand which felt a bit stiff to use and subtly decorated with the Eve logo and a variable hinge to angle it anywhere within its range. The hinge felt very durable too. Like the Surface Pro, the Eve V’s keyboard also doubles up as a protective cover for the screen, and has quite a nice touch to it actually. If you want to make the full use of Windows 10, there's a fingerprint sensor laden power key on the right side for Windows Hello authentication. There's two USB Type-C ports, one USB 3.0 and a Thunderbolt 3 port, which is a massive connectivity advantage over the Surface Pro 4. You also get two full size USB 3.0 ports, a wireless 3.5 mm headphone jack with dedicated audio amplifier and a microSDXC cards slot concealed under the kickstand. The Eve V also features a 100% QC check policy. So every single device is going to be calibrated out of the factory. The keyboard on the Eve V also doubles up as a protector for the device like the Surface Pro. The keyboard snaps on magnetically on the V’s base and has a beautiful alcantara finish which is very comfortable. The keyboard offers two typing positions to make things further comfortable. Keys have a decent travel of 1.2 mm, again precisely specified by community members and a tactile feel with individual RGB key lighting with customizable options which was also preferred by the community of crowdfunders. The keyboard features Bluetooth 4.2 so you can use it when detached from the Eve V body but then you won't be able to adjust any typing positions. The keyboard can also be paired to other devices (three in total). It also features some playful stylistic elements like the ‘V’ key that has been replaced by the company's logo and backspace key which says ‘oops!’, all of which pack in an Alcantara-clad 1.6 mm thin body. The trackpad has Gorilla Glass covering and features the latest ClickPad by synaptics. So you can left or right-click by using one or two fingers, pinch to zoom, and a three-finger flick. The level of key travel and responsiveness of the trackpad is impressive. The 12.3-inch 3:2 IGZO LCD panel with an impressive 1400:1 contrast ratio on the front is same as the Surface pro 4 and offers Gorilla Glass 3 protection with 10 point multitouch and has an almost air gapless design with anti-reflective coating. The 2736×1824 pixel resolution display shows beautiful colours and crisp images. Sunlight legibility is low though, so using it outdoors on a bright sunny day would be a pain with max brightness of 450 nits. The display also supports the company's own two-button V Pen stylus which detects up to 1024 levels of pressure sensitivity and has the same functionality and compatibility offered by the Microsoft Surface Pen. The stylus also supports Microsoft Ink. The Eve V is also compatible with other styluses. The base $700 model comes with an Intel Core M3 CPU, with 8 GB of RAM and 128 GB NVMe SSD. Increasing the price a bit higher gets you a Core i5 CPU with 256 GB and $1400 can get you the Core i7 CPU with 16 GB of RAM and 512 GB SSD, but what you don't get in any of the variants is a 1 TB hard drive,which is present in the Surface Pro. Also, all the CPU listed above are Y series CPU which consume low power and does not heat up as much as a conventional CPU, which has helped Eve to omit the cooling fan, thus preventing additional bulk. The CPUs are not for gaming and choices were made the community members which does not comprise of gamers. So, in absence of any fans, cooling is handled through a copper heat sink and Intel heat pipes which helps dissipate heat through the curved cushion style aluminum chassis. Eve says, with this technology the Core i5 running Eve V outperforms an Asus Transformer 3 running a Core i7. And it really felt like it would as the device just performed flawlessly and butter smooth all the way. Webpages were loading fast and apps were butter smooth with similar experience while browsing and the device never had the tendency to heat up even after long term usage. The Eve V has a 2 MP front camera and a 5 MP rear facing camera, both of which click decent images with good colours but kind of lack detail in the shots. 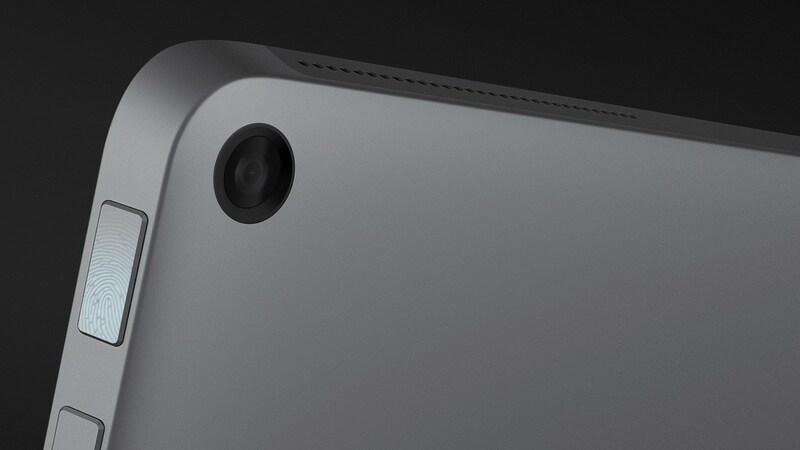 The camera setup on the Surface Pro is better than the V’s , with a 5 MP camera at the front and 8 MP camera at the rear. However the community members also chose the camera setup on the Eve as they thought they wont be using the cameras so much on their devices. Didn't they think of Skype!? Making the device thicker as per community directives has allowed Eve to add a large 48 Watt hour battery which Eve says should last up to 12 hours unplugged after a full charge. That claim being true or not, the device should easily last a full working day without any problems. The Eve V packs in four speakers of 1 Watt power each, which pump out decent quality audio with excellent clarity and loudness through the vents permeating the top of the body. Just don't expect any bass from them. The speaker vents also accommodate two noise-cancellation microphones, so you can expect good audio capture while using Skype or interacting with Cortana using your voice. The enticing 2-in-1 has certainly roused people’s interest and with a starting price of $799, the deal gets even sweeter. 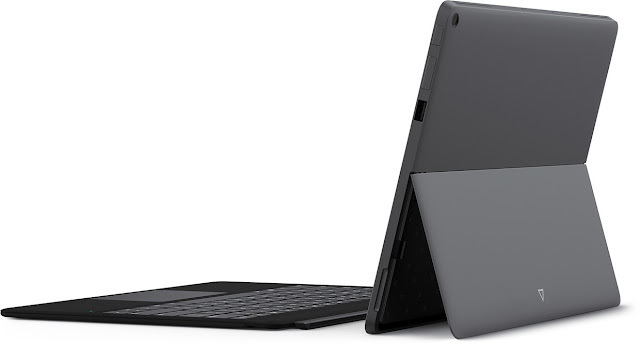 Even the $1400 top-end model is around $500 cheaper than the equally specced Surface Pro. Sure it may have some flaws, but looking at them would be nitpicking, as the rest of the device is quite awesome. And following the preferences of its normal users, it had to be! The only thing limiting the Eve V’s availability right now is batch production.